Dan Shaughnessy this morning writes one of the weirder things I've ever seen — even from him! Anybody else spooked by that center-field door opening when the Red Sox were batting in the bottom of the ninth 10 days ago? It was a moment. We’d just witnessed the apocalyptic implosion of Jonathan Papelbon and all the air was sucked out of Fenway as sad Jed Lowrie came to the plate. Suddenly, the door flew open. It was as if the Babe, or Dom DiMaggio, or any number of ghosts of Octobers past popped in for a visit. Red Sox third base coach DeMarlo Hale told Chone Figgins that the ghosts were in play. Figgins alerted the umpire and Torii Hunter went over to close the door. “I have no idea how it opened,’’ said Hunter. Maybe Dan's sharing a wink with us, knowing that we know that he's the creator of one of the worst "curse" theories ever to gain widespread traction in the brainless sports media. But I doubt he's that self aware. 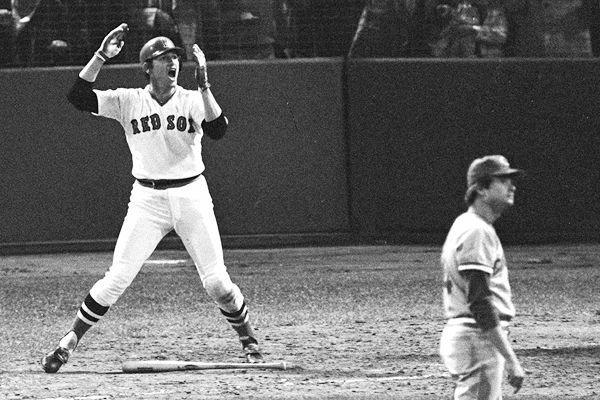 But if the Sox, God forbid, go another year or two without a World Series ring, remember this date. It's when Dan's next book was born. It took him 10 days to come up with this? Man, One Note Charlie has lost his fastball. Just his wishful thinking. He’s the one guy who DID lose his identity when the Sox won. I can see it now: book tours for Shaughnessey’s latest – “The Curse of the Loose Hinge”. Although I think he has to wrest the rights for that title away from the guy writing Milton Bradley’s biography. IH – as tbs would say: very funny! of course it was classic Shank, starting off with a shot at Schilling… what a joke this guy is. isnt this the same Dan Shaughnessey who said the Red Sox were just rope-a-doping the yankees when they got swept in late september? So this will be an autpbiography? Or even an autobiography, perhaps? How sweet it is. The day after a great game and the lead here is Shaughnessy? It’s why I love listening to WEEI these days. All they have to talk about is the Patriots. As Kevin Youkilis could have told the CHB, that was just Elijah. When do we revive the “CC-is-not-an-Ace” discussion? Or Choke-Rod? Can someone explain to me how ghosts work? How could Babe be in Boston AND New York at the same time? I was watching the replay of Game 7 2003 ALCS and Boone said “Jeter said the ghosts would show up.” Does Jeter know something we don’t know? Do these ghosts hang out at BOTH ballparks? I will go ahead and contact someone who handles paranormal activity so that we can straighten this out. > When do we revive the “CC-is-not-an-Ace” discussion? Or Choke-Rod? Wow, I never thought SFs here to actually be gracious, but to entirely ignore the events of the last week given the numerous relevant discussions over the course of the season? Wait that question isn’t relevant for site called YFSF? And the day after a great game? Nah, instead let’s talk about CHB. Makes sense. Hopefully about the same time the discussion about JD Drew’s value comes up. In line with the theme, looks like Phillips ruined his marriage for a ghoul. Proportionally, “debunking” JD’s value has received much more attention. How about even one post highlighting the awesomeness of CC-Rod? How about we talk about what the post is about? If you do not like this topic, there are plenty of other places to discuss the topics which you are seeking opinions on. You are disrespecting Paul and his post. Please. Enough. Do not engage him. Please. Stay on topic, as difficult as that may be. There will be a post that’s Yankees related shortly, until then stay on topic. How soon after a Sox win does the obnoxious photo appear here? Now I’m disrespecting someone cause I point out the folly of CHB and his ghosts? Phillips horrid ghoul is at least fun and sad. Second request for you to desist. I’m still researching the intricacies of how Dom DiMaggio’s death this year has potentially cursed the Sox. There are all sorts of pitfalls here. You just never know when the death of a random great player in your team’s history could spark a swift playoff exit. And people say baseball is all about not making outs. Clearly, it’s not making outs and keeping ex-players on life support until the offseason. Between Yankee Stadium, Fenway and the Field of Dreams field it’s nice to know ex-legends and current ghosts have a place to hang out. I can only imagine that the reason 2004 even happened was because the Yankees ghosts were playing a nine inning game in Iowa and couldn’t get back in time to help. It’s the only possible reasoning. You’re just now figuring this out, Sam? Actually, there were two slightly more relevant notes in this generally lame column. Lastly, Paul, which is a worse curse theory – Shanks’ of the Babe or the Cubs of the goat? Me, I vote Shanks’ as the worst. The goat theory is idiotic on its face, and I really don’t hear it used much as shorthand for the Cubs’ woes like the “Curse of the Bambino” was for the Sox’. Not that “Curse of the Bambino” isn’t idiotic on its face, but come on, a goat?